Sainted Gregory the Wonderworker (Thaumaturgus), Bishop of Neocaesarea, was born in the city of Neocaesarea (northern Asia Minor) into a pagan family. Having received a fine education, from his youth, he strived for Truth, but the thinkers of antiquity were not able to quench his thirst for knowledge. Truth was revealed to him only in the Holy Gospel, and the youth became a Christian. For the continuation of his studies Saint Gregory set off to Alexandria, known then as a centre for pagan and Christian learning. The youth, eager for knowledge, went to the Alexandrian Catechetical School, where the presbyter Origen taught. Origen was a famous teacher, possessing a great strength of mind and profound knowledge. Saint Gregory became a student of the presbyter Origen. Afterwards, the saint wrote thus about his mentor: “This man received from God a sublime gift – to be an interpreter of the Word of God for people, to apprehend the Word of God, as God Himself did use it, and to explain it to people, insofar as they were able to understand it.” Saint Gregory studied for eight years with the presbyter Origen and received Baptism from him. The ascetic life of Saint Gregory, his continence, purity, and lack of covetousness aroused envy among his conceited and sin-loving peers, pagans that they were, and they decided to slander Saint Gregory. One time, when he was conversing with students on the city-square, a seductress notorious throughout the city came up to him and demanded payment, for alleged sinful services rendered. At first Saint Gregory gently took exception with her, that she was mistaken and assumed that he was someone else. But the profligate woman would not be quieted. He then asked a friend to give her the money. Just as the profligate woman took in hand the unjust recompense, she immediately fell to the ground in a demonic fit, and the fraud became evident. Saint Gregory said a prayer over her, and the devil left her. Having returned to Neocaesarea, the saint renounced the worldly affairs into which influential townsmen persistently sought to push him. He fled into the wilderness, where by fasting and prayer he attained to high spiritual accomplishment and grace-bearing gifts of perspicacity and prophecy. Saint Gregory loved life in the wilderness and wanted to remain in solitude until the end of his days, but the Lord willed otherwise. 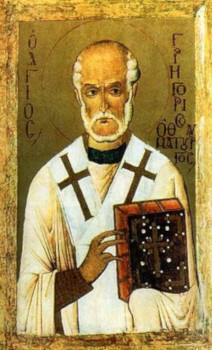 The bishop of the Cappadocian city of Amasea, Thedimos, having learned about the ascetic life of Saint Gregory, decided to have him made bishop of Neocaesarea. But having foreseen in spirit the intent of Vladyka Thedimos, the saint hid himself from the messengers of the bishop who were entrusted to find him. Then Bishop Thedimos ordained the out of sight saint as bishop of Neocaesarea, beseeching the Lord, that He Himself would sanctify the unusual ordination. Sainted Gregory perceived the extraordinary event as a manifestation of the will of God and he did not dare to protest. This episode in the life of Saint Gregory was recorded by Sainted Gregory of Nyssa. He relates, that Saint Gregory of Neocaesarea received the highest priestly dignity only after the performing over him of all the sacerdotal requirements by Bishop Thedimos of Amasea. Before ordination, when it was necessary for him to pronounce the Confession of the Faith, Saint Gregory prayed fervently and diligently imploring God and the Mother of God to reveal to him the true form of worship of the Most Holy Trinity. At the time of prayer the All Pure Virgin Mary appeared to him, radiant like unto the sun, and together with Her was the Apostle John the Theologian dressed in archepiscopal vestments. At the bidding of the Mother of God, the Apostle John taught the saint how to correctly and properly confess the Mystery of the Most Holy Trinity. Saint Gregory wrote down everything that the Apostle John the Theologian revealed to him. The Mystery of the Symbol-Creed of the Faith, written down by Sainted Gregory of Neocaesarea is a great Divine Revelation in the history of the Church. On it is based the teaching about the Holy Trinity in Orthodox Theology. Subsequently it was made use of by the holy Fathers of the Church: Basil the Great, Gregory the Theologian, and Gregory of Nyssa. The Symbol of Saint Gregory of Neocaesarea was later examined and affirmed in the year 325 by the First Ecumenical Council, showing his enduring significance for Orthodoxy. Having become a bishop, Saint Gregory set off to Neocaesarea. Along the way from Amasea he expelled devils from a pagan temple, the priest of which he converted to Christ. The convert was witness to still another miracle of the saint: through his word a large heap of stone shifted from its place. The preaching of the saint was direct, lively, and fruitful. He taught and worked miracles in the Name of Christ: he healed the sick, he helped the needy, he settled quarrels and complaints. Two brothers in sharing an inheritance were not able to agree over a lake property of their dead father. Each of the brothers gathered round himself like-minded friends. They were ready to come to blows. Saint Gregory persuaded them to delay the finish of their dispute until the following day, and he himself prayed all night long at the shore of the lake causing the quarrel. When dawn broke, everyone saw that the cause of the dispute was no more – the lake had gone underground. Through the intense prayer of the saint there now flowed but a stream, and the course of its flow defining the boundary line. Another time, during the construction of a church, he gave command in the Name of Christ for an hill to move and make room at the place of the foundation. When a persecution against Christians began under the emperor Decius (249-251), Saint Gregory led his flock to a faraway mountain. A certain pagan, knowing about the place of the Christians, told this to the persecutors. Soldiers surrounded the mountain. The saint went out into an open place, raised up his hands to heaven and, having given orders to his deacon on what to do, he began to pray. The soldiers searched the whole mountain, and they went several times right past those praying, but not seeing them, they gave up and went. In the city they reported that on the mountain there was nowhere to hide: no one was there, and only two trees stood alongside each other. The informer was struck with amazement, he repented his ways and became a fervent Christian. Saint Gregory returned to Neocaesarea after the end of the persecution. By his blessing church feastdays were established in honour of the martyrs that had suffered for Christ. During these times there began to spread about the false teachings of the heretic Paul of Samosata (Samosata was a city in Syria). This heretic confused together the Essence of the Undivided Trinity with the Essence of One God the Father, confounding the minds of many Christians by his talks and writings. The heretic Paul of Samosata was condemned at the first Antioch Council, assembled in the year 264. Saint Gregory occupied a prominent place at this Council. By his saintly life, his effective preaching, working of miracles and graced guiding of his flock, the saint steadily increased the number of converts to Christ. Before his death (c. 266-270) there remained in the city only 17 pagans. But when Sainted Gregory Thaumaturgus, Bishop of Neocaesaea, first entered onto the cathedra, there were in the city only 17 Christians.